MANILA, Philippines–What will happen if the Philippines was hit by a 6.7-magnitude earthquake? 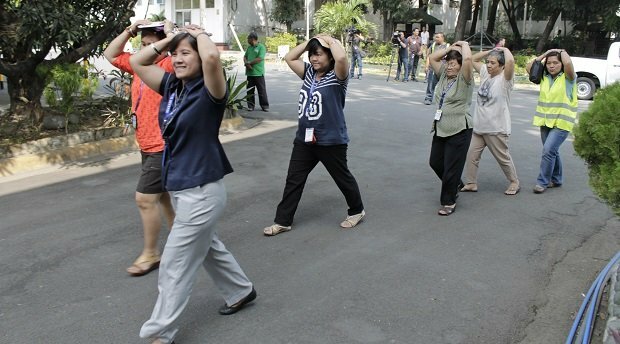 The National Disaster Risk Reduction and Management Council held the 1st Quarter Nationwide Simultaneous Earthquake Drill on Wednesday, March 19. This was the first drill after the 7.2- magnitude earthquake in Bohol last year. The ceremonial venue of the nationwide drill was held at Bicol University in Albay. It was attended by Defense Secretary and NDRRMC Chairman Voltaire Gazmin, Albay Governor Joey Salcedo, NDRRMC Executive Director Eduardo del Rosario and other local officials. Thousands participated in the mock situation of a 6.7-magnitude quake with a fire scenario. Office of Civil Defense regional offices nationwide conducted the earthquake drill in schools and other government facilities. “We do this quarterly to inculcate to the memories of elementary and high school students to know what to do, where to go [in case of an earthquake],” NDRRMC spokesperson Major Rey Balido told reporters. At the operations center, Balido said the means of communication or “redundancy of information” was also tested. “We don’t use only one form of communication. We used SMS, fax and social media to disseminate the information and how fast can our regions can acknowledge, how fast they could get a report to send to us,” he said. In the aftermath of the Bohol quake last October, Balido said the major problem was communication in far flung areas. He said they will procure satellite phones to be able to use as a back-up in case all forms of communication bog down. He noted several organizations also donated satellite phones. A few minutes before the drill began, Balido also noted that the Internet at the operations center went down. “So we have to improve this to avoid [these problems],” he said. An assessment will be held at each region later on, he added.